Bourbon and food have been paired together for as long as bourbon has been around, yet many consumers aren't sure which kinds of bourbons go best with which kinds of foods. While most people, of course, could tell you that red wine goes well with steaks and white wine with fish, fewer people have a sense of whiskey and food-pairing rules. Fortunately, there aren't rules, or any long-standing orthodoxy, at least. Chef Newman Miller, whose restaurant is in Maker's Mark Kentucky distillery, thinks the main priority of incorporating bourbon into your meal should be enjoyment—and that, of course, is based on personal tastes. But if you're looking for some guidance for your next gathering in which bourbon plays the star, here are some things to keep in mind. Before you even think about sophisticated bourbon-food pairings, know that you can never go wrong with pairing a really excellent bourbon with a really excellent dish. "I'm an ardent believer that good goes with good, almost always," says Miller. "With wine and beer, there's a bit more nuance that can be found because of the lower ABV. I'm not saying that whiskey doesn’t have that nuance, but for a person who is intimidated to pair, picking out those notes in the whiskey can be harder." The best way to get into it, Miller says, is to start. "Find something you love already to eat," he adds. "And then sort of ease into it with the drinks, then go to cocktails, then go to rocks, then go to neat." 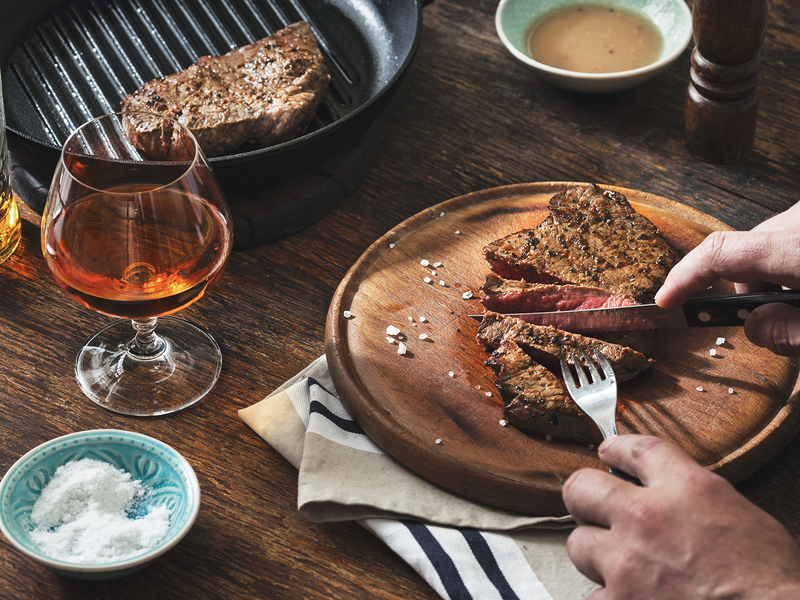 Miller loves playing with smoke in his cooking—he recently joked that a smoker is the only tool he knows how to use—and he thinks those flavors go really nicely with bourbon. "There’s not a lot of smoke in the bourbon process," he says. "When you think of other whiskeys, there's a lot of smoke. What's cool with bourbon is that you can definitely cook with smoke, and that flavor is so complementary with the charred oak barrel. Those flavors are related." Hence, you don't get an overpowering smokiness. If you're doing a whole dinner with bourbon pairings, the food should probably progress in intensity. "If I have a bright acidic drink, I'm going to cook something that’s the opposite; that’s what's going to get country ham and gravy," he says. "An old-fashioned is going to get a lighter flavor dish, because there really should only be only one big star." While a classic wine pairing dinner typically includes just, well, wine, Miller believes that you can — and should! — do a bourbon pairing dinner that mixes it up with other libations. "Just drinking whiskey neat the whole night, it's more of a longevity problem than it is a palate problem," he says. "That's where the cocktail comes in." The meal should be an opportunity to have fun, and throwing excellent beer and wines into the mix will maximize the fun. Miller, who recently cooked a dinner at the James Beard House in New York, paired each course with bourbons, sometimes in cocktail form. There was some wine, too. "If I could change one thing about that dinner, I would have put a beer in there," he says. "It's just more fun." In keeping with the spirit of fun, Miller suggests starting off dinners by offering guests a small Old Fashioned shot, which he sometimes does with his own dinners. Desserts still deserve pairings, and there's a whole genre of dessert bourbons with nice red tannin notes that pair excellently with cake, chocolate and, Miller's favorite, sticky toffee pudding, which has bourbon in it. For an easy digestif, Miller adds a splash of Zucca Amaro, which is an Italian rhubarb amaro, to Maker's 46 bourbon. Before you go forth and pair, remember that you really can't mess up. "I just want to make sure that people don’t think there’s a right or wrong way to do it," Miller says. "I think that’s the stumbling block so many times. You can take it super serious, but it's such a good opportunity to have fun." Нашел в интернете интересный интернет-сайт на тематику богатейшие люди планеты.